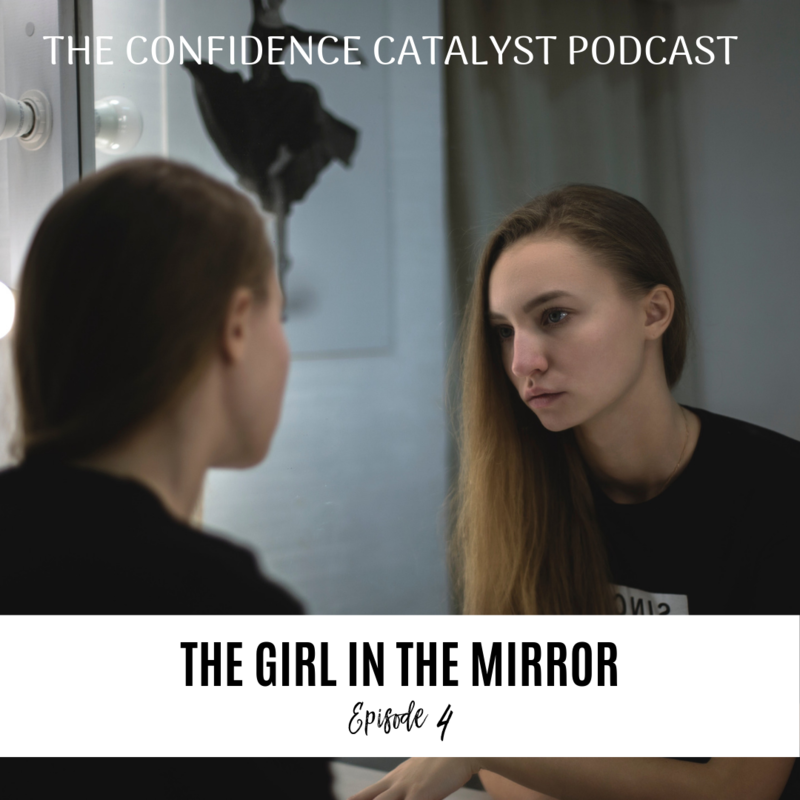 I’m Hannah Coles, LDS Life Coach and you are listening to The Confidence Catalyst podcast episode number four, The Girl in the Mirror. Welcome back everyone! I’ve got something good for you today! We’re talking about the mirror today and how to make peace with the girl in the mirror. Which I know is a huge struggle for so many of us and it doesn’t have to be. So let’s bring that to light today and talk about that girl that really wants to be your friend if only you’ll let her. So, recently we found a box with all our old phones in it. Why we kept them all is a mystery to me if not for how fun it was going back through pictures and videos that amazingly enough still worked. The first iPhone was super fun to whip out. It’s tiny and thick and brought back so many memories. I remember needing a new phone and going into att and looking around and the salesman told me I was eligible for an iPhone. Not knowing what an iPhone was I wasn’t sure I needed it. So he told me, it’s a computer but on your phone. Also you’ll need to pay a separate fee for data and on and on. He wasn’t selling it. Why would I need a computer on my phone? I don’t want to pay anymore than I’m already paying. So I left that day with an upgraded phone that, get this…scrolled the numbers when you touched it. I was so giddy that it did that! Okay, so fast forward a few weeks and my husband goes into get a new phone only he’s sold on the iphone. So he comes home and won’t stop playing with it. I vividly remember this one afternoon sitting in our living room him in one of our cozy chairs and me in the other just looking at him and him glued to his phone. I totally didn’t get what the big deal was and I told him, “Stop playing with your phone! Pay attention to me”. So he hands his phone over to me and starts showing me how awesome it is and I totally laugh at that now because I so went in not that long after and got my own phone to be glued to and the rest is history, right? It’s like Steve Jobs said, “they don’t know what they want until we show it to them” – I didn’t know how much I’d love and come to rely on this little piece of technology. So, back to the box of old phones. We must have given the kids our old phones to play with once we upgraded because most of the pictures were of them. Tons of selfies, videos of them making silly faces, talking to themselves, narrating each and everything they were doing at that time. It was obvious that they loved seeing themselves, talking to themselves, loving being with themselves. I read an article once talking about how humans are different than other animals and it listed off several different species that can recognize self or are self aware when they see their reflection. These other creatures love to look at themselves, play with their reflection, are curious of themselves but what was fascinating was that humans are the only ones that look at their reflection and scowl, feel disgust, distain, and are repelled by their own reflection. Every other creature that had that sense of self-awareness loved seeing themselves all except humans. Why is that? Why is it that when we see our reflection back the usual immediate response isn’t love? But dislike, disgust, or hate even? There was a study done recently with 2000 teenage girls asking them questions about what they thought of themselves. 9 out of 10 girls said they were unhappy with their body. Only 8% said they were happy with their appearance. Why are we spending so much of our time here on earth, this mortal journey worried about how we look? Why are we expending so much of our mental energy hating our bodies, our looks, ourselves? Media for starters plays a huge role in what we think about ourselves. Let me rephrase that. The media is NOT to blame because the media can’t MAKE you anything but it can offer a new perspective and invite you to try on thoughts, ideas, and ideals that you might and probably did adopt. Women are continually bombarded with images of the ‘ideal’ face and figure…Constant exposure to idealised images of female beauty on TV, magazines and billboards makes exceptional good looks seem normal and anything short of perfection seem abnormal and ugly. It has been estimated that young women now see more images of outstandingly beautiful women in one day than our mothers saw throughout their entire adolescence. That article is over a decade old – I don’t know what the current stats are but you can take guess. Why are we choosing to believe that what is shown on TV, in magazines, in movies, commercials is the right way and what we look like is the wrong way? Who is the authority figure that gets to decide that? Those images, they’re just circumstances. Which if you’re new to what I teach then let me take a moment and expound here. Circumstances are anything that is out of our control. What ads are shown on TV, the magazines on the racks at the grocery store. What other people say. The current number on the scale. All out of our control. The best thing about circumstances though is that they’re NEUTRAL. They don’t mean anything. They’re not good or bad until – here’s the key, until YOU place or attach a thought to them. My son is eight and he’s small for his age. When he steps on the scale he sees a number and doesn’t quite know what it means. He’s curious. He asks me what it means because to him, it’s just a number. But if you stepped on the scale right now, what would your reaction be? For many women it’s an automatic negative thought and feeling. They step on the scale, they see a number – circumstance. That circumstance triggers a thought within them, “I’m so fat”, and then that thought generates a feeling for them. When you think, “I’m so fat” what do you feel? Disgust? Disdain? guilt? Shame? It wasn’t the scale that created that feeling for you. It was your thought about the scale. It’s important to know that because we tend to bypass our agency in this process. We think the media is bad. It’s the media’s fault that I feel fat. But it’s not. The media is a circumstance. It’s neutral. You get to decide what to make that mean about you. And why would you choose to make it mean something negative and terrible about you? Let me ask you this and if you have a piece of paper I highly recommend you write this down. What are your current thoughts about your appearance? When you look in the mirror what are your immediate thoughts? Write it all down. Too many of us live in shame and we don’t want to talk about it not even to ourselves. We just have this inner mean girl that tells us that we’re fat, ugly, old, and that no one is going to like us. This is terrible! But we don’t ever stop and question any of it. We just take it and believe it. 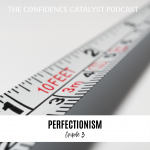 We’re too busy trying to be this “perfect” being with perfect looks and a perfect body and perfect hair that we’re missing the plain and simple question of, What is perfection anyway and who gets to decide that? Are you aiming for the less than 1% of the worlds population that the media defines for us as perfect? Did you catch that? Less than 1% – and that’s what we think is perfect? That’s what we want to strive for? Why not ask yourself this instead, how do I know I’m not perfect now? Societies definition of perfect has changed throughout the ages. ”You’ve gained weight” is a traditional compliment in Fiji, anthropologists say. Dr. Anne E. Becker, director of research at the Harvard Eating Disorders Center of Harvard Medical School, who investigated shifts in body image and eating practices in Fiji over a three-year period. Just three years after the media was introduced into their culture they reported that about 75% of the women in their study felt they were overweight and had increasingly lower self esteem and confidence. Here was a culture that found pride in robust figures. That was what was beautiful and ideal but then they let the media dictate perfect, beauty standards for them and things went downhill. Beauty trends change all the time. I look back at old shows like the Cosby show that I grew up with and those clothes, the make up – wow. The seventies, bellbottoms, the early 90’s and crimped hair – do you remember that? I used to have a crimper and thought it was so cool. Fashion and beauty standards keep changing and who is the ring leader? Who gets to decide this for us and our culture? Why are you letting those outside sources influence your relationship to your body? If perfection standards continue to change so why not just try on the belief that maybe you’re there now. Maybe your hair is amazing right now. Maybe it’s amazing because it’s not like everyone else’s. Maybe it’s perfect because it’s yours. When we lived in Puerto Rico we spent a good deal of time on the beach. We loved living there and the ocean was just so beautiful and warm! But I wasn’t comfortable wearing a bathing suit. I felt really self-conscious because I wasn’t part of the 1% ideal body size. Then I had this breakthrough one afternoon. I was sitting in a lawn chair on the beach and there were tons of people around. Tons of families and friends having picnics, playing music, playing with frisbees, just a really fun family afternoon for so many and I looked around at all these super happy, joyful faces and people and I noticed there were so many different shapes and sizes and people of all percentages happily walking around on the beach enjoying life and here I was sitting in my lawn chair with my towel around my waist and legs because I felt fat and not comparing but I wasn’t overweight by any means. I just wasn’t part of the 1% so therefore I wasn’t acceptable. It wasn’t until that moment that I started to question, wait, they’re all having fun and sporting their swimsuits and just loving life and here I am hiding. I want to have what they have. I want to be confident and love who I am and what I look like. Why can’t I have that? Why have I been hating myself and my figure for so long? I realized how much time I wasted being mean to myself about not fitting into the 1%. And maybe I didn’t want to be a 1%er anymore. Maybe I wanted to be like the other 99% of the beautiful people in the world and enjoy mortality and that I have a body that can do amazing things. So I invite you to not wait any longer. Go through your list and question every single one of them. Question why you think you’re not perfect now. Question the standard that you’re holding yourself up to. Question where you got that standard and ideal image. Pretty sure there isn’t one in the scriptures. Pretty sure they’ve never announced a, “You must look like this to enter the gates of Heaven” – So if it’s not coming from a divine source – where is it coming from and do you want to continue listening to it? Then I want you to practice something. I want you to practice looking at yourself, looking at your face in the mirror or in a selfie even. Too many of us look in the mirror only to berate and chastise ourselves. What if you could look in the mirror and change the dialogue? What if you could get to the place where you could look in the mirror and like what you see, learn to love what you see looking back at you? Wouldn’t that be amazing? This is an amazing idea. I loved her go through her selfies each morning when her hair stood straight up, when she looked half awake. And she purposely took these pictures RIGHT, RIGHT after waking up. It wasn’t after I brush my teeth or look in the mirror kind of pictures. She said she did it right then before her mind was really awake, before she could attach judgements or the thoughts of wanting to take a picture in a different light, different angle. She just woke up and snapped the picture. Then she went through several pictures noticing all these different things about herself. She looked vulnerable, a look that not very many people ever get to see from her. She looked open to possibility and not already weighed down with judgements or attachments to thoughts. I love the idea of taking real authentic pictures of ourselves. We are surrounded with images in social media, media in general, magazines, movies, ads, peoples walls, everywhere we see images of as she puts it, “highly curated (posed) people”- it’s no wonder when we look in the mirror at our raw image that we shriek. But all those curated images aren’t real. Why do you think there are so many apps out there to filter, alter, change your photos? We struggle to see and appreciate who we really are and our perception of what beauty is. It’s time to question who’s deciding what qualifies as beautiful. Why are we letting the media, strangers decide for us? Why are you living your life berating and hating yourself because you’re not one of the 1% people. Guess what? Neither am I. Neither are the other 99% of the people on the planet. So let’s start making peace with the girl in the mirror. Go listen to Michael Jackson and sing to yourself, “I’m asking her to change her ways. If you want to make YOUR world a better place, take a look at yourself and make that change” – I addlibed at bit. But you know what I’m saying. The change you want, your world can change by changing what you think of yourself, how you see yourself, how you love and accept yourself. When you can look at yourself with acceptance, appreciation, admiration- think about how differently you’d show up in the world? Think about how much more apt you are to offer others the same in return. When we’re not worried about how we look and instead appreciate the little details about us we’ll start noticing that in others too. Each of us has a relationship with our bodies. We don’t think about it in that light but we do. We think about our appearance, our shape, our body and we have a feeling about it. What kind of a relationship do you have with yours? Are you judge-y? Are you a bully? A mean girl? How are you ever supposed to feel good if you’re constantly beating yourself up? You only have one body, one life. Do you really want to expend your time hating it? Think about this, when you see a picture of a baby what do you think? Do you go, Awww…she’s so cute! I saw this clip on facebook a while back of these quadruplets hugging each other. They were just barely walking and they’d just all go back and forth hugging each other. I watched it like a dozen times smiling, laughing, adoring these babies because they were so precious. Not once did I judge them, think anything ill of them, think oh, my goodness – their thighs are so big! NO! They were just precious. With my own kids, I love looking back at pictures we have of them. Even on my phone now I have tons of pictures of them and I love each one. Sometimes they’re making weird faces and I don’t have a mean thought about them. I just love them. I simply love them. I don’t think, “oh that’s not really them. They really look much cuter.” No, these weird pictures are cute too. We need to get to this space with ourselves. To love every part of us. To not think, “Oh that’s an ugly picture. Let’s do that again” – just accept and love you. Nothing is wrong with you. You are whole and wonderfully beautiful right now. I love the selfie exercise but I love the mirror or even Marco Polo exercise even more. I tried Marco Polo for the first time this last year and immediately was hooked because it’s so much faster than texting. I can talk to my friends and just share a thought and they can get back to me whenever and I can see them and hear their voice and it’s just fun but what I also really love about it and it’s such a good practice is that when you pull it up you’re looking back at yourself. You’re seeing what they’ll see and it’s so great to see yourself and how you talk, to see how you light up when you’re talking about something or someone you love. You can see the colors in your eyes and your smile when you get excited. This is a gift my friends. This is what other people love about you. The way you look at them, smile at them. Give this gift to yourself. See what they see and love about you and learn to love that about you too. It might feel weird at first but it’s just commitment and practice. When you can finally make the commitment that you don’t want to talk to yourself like that anymore. When you make the decision that you don’t want to feel that way about yourself anymore. Choose a thought to replace the negative soundtrack in your mind. For me, I used the words STOP IT – before Elder Uchtdorf made them cool. I knew that I was done feeling that way and that I didn’t like how it felt when I talked to myself that way. So I just decided that whenever a negative thought would arise I’d just say, stop it. I committed to that action. And it was tough at first. We get addicted to this self – loathing behavor and thoughts. So when you’re trying to change that your mind is going to protest something fierce. It’s going to want to persist even louder, even meaner and you just keep re-commiting to the new thought, the new belief. Stop it. Just stop it. I’m not going there anymore. Sometimes I’d have to say stop it again and again and again just on repeat until the thought would dissipate and leave. It wasn’t super fast. I had decades of practicing the mean thoughts that I was fighting against. But it was powerful. The thoughts did stop finally and then I had a clean slate to work with. 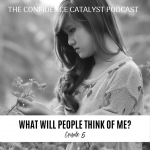 What did I want to think about me? What did I want in my relationship with myself? I wanted to love me. So I replaced stop it with I love me. Every time I’d look in the mirror I’d practice those words. Every time I saw a picture I’d say, I love me. I love me. I love me. I love me. Just like I do with my kids, with my husband, with my pets. I love them. I love them and that thought creates love. I smile when I see them in those pictures. I create love. You can do this for you too. Remember the steps: Find out what you WANT to think of you. Really truly what kind of relationship do you want with you? When you learn to love and accept that girl in the mirror your whole world will change. Your thoughts create how you feel. When you think and believe that you’re ugly and fat. How do you think you’re going to feel? Then we wonder why we’re not happy. Let’s rethink this. Pick a thought. If you can’t think anything positive yet – just get to neutral. Here are some thoughts to try on: Stop it – this worked for me. You can think, there I am. I have a body. I’m human being. This is where I’m at today. Pick one thought and commit to it. Commit to yourself that anytime a negative thought wants to pop up that you’re going to pause it and replace it with the new thought. You’re training your brain to think what you want it to think. Just like you’d train your dog to sit. The dog is going to continue to jump and run and be wild so you just keep working with it and teaching it again and again, “no, we’re not jumping right now. We’re learning to sit.” And after a while the dog finally learns. Train your brain the same way. Commit to the new thought and practice again and again and again. Notice how differently you feel when you think and believe these new thoughts. Even when I just told myself stop it. It was a neutral thought so I wasn’t happy or joyful yet but I wasn’t sad, ashamed, or hating myself either. Get yourself out of loathing and hating yourself to neutral. Then from neutral you can get to acceptance, appreciation, love, and even adoration. It is possible you can look at a picture of yourself, a reflection in the mirror, a Marco Polo image of you and think, “I adore that girl”. It might not be possible YET but it is possible and it’s amazing. Start today. Grab a piece of paper and start writing what you think of yourself and ask yourself why. Question all those illogical thoughts and question where they came from in the first place. Then ask yourself if they’re helpful. Do you like how you feel when you believe them? Do you want to change them? If the answer is yes then pick a thought. Maybe start with a neutral thought. Just to get yourself out of judging and hating. Then commit to it. Practice that thought every single time your mind goes to default and wants to practice those old habits. Remind yourself that you’re not thinking that anymore and practice the new thought. Practice talking to yourself and sure, your friends and family can listen in too on Marco Polo. Look into your eyes and really see what color they are. What tiny flecks are in there? Eyes are amazing. Every single eye. The colors are just incredible. Start there. Look into your eyes and start letting one appreciative thought in at a time. Notice how you feel when you think those appreciative thoughts. It makes a huge difference. Talk to that girl in the mirror. It’s time to change. It’s time to make your world a better place and you can do that one thought at a time.